How we dress can have a great effect on our self-confidence. One of the things we love about fashion and clothing is it’s so personal. You choose it; it’s up to you. It has so much to do with your mood, how you’re feeling, and it can speak volumes about you in a split second. It’s no secret, what you feel on the inside is what you project energetically out into the world around you. When you visit us at the store, it doesn’t matter if you’re having a ‘meh’ day. It doesn’t matter that you just had a baby and your body has gone through some changes or you had a breakup and can’t get your groove back. As espy stylists, we look past that and want to work and connect with you as an individual. We believe in the power of dressing for your life’s success. Whether that means finding an outfit for getting back into the dating scene, your next job interview, or for some self-care. We believe that we can help heal people by dressing them in things that make them feel their best, so they feel the freedom and confidence we all long for, and in turn, change their attitude and outlook. Partnering up with the Alzheimer Society of Calgary for #spreadloveyyc has allowed us to meet some truly amazing and inspiring people. One such person is Samantha. 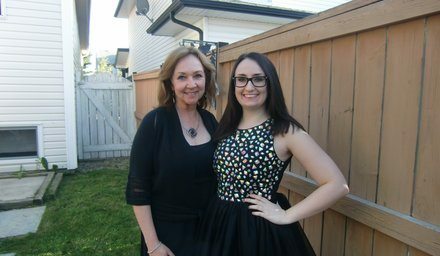 At just 26 years old she became the primary caregiver for her mom Shawn when she was diagnosed with Alzheimer’s at just the age of 56. While most people in their mid to late twenties are starting their own lives and families Samantha is trying to find balance in her own life. Trying to take care of a parent while still trying to finish school, find a new career, date and just be a 20-something are just a handful of challenges she faces. Extremely moved when they heard about Samantha and her story the stylists wanted to reach out and see if they could help her out the best the way they knew how. At espy, it’s more than just getting styled. It’s about helping you cultivate a routine of self-love. It’s helping you present your best self in a way that can invoke a confidence that transcends beyond bad days, outlooks or attitudes. We’re in the business of making people feel good. We’re real people and sometimes all it takes is one positive interaction to change someone’s self-image. This belief drives all our relationships with our customers whether it’s their first time in the store or they have been with us since the beginning. We help them see the very best version of themselves. The reason espy is an experience is that you feel it. Using fashion to build self-confidence is an intentional ripple effect of what we have to offer. We invited Samantha down to the store for a personal styling session with one of our very best; Linda. We also gave her $500 to spend in store as a thank you for not only being an inspiration but as a gift for some self-care and love. 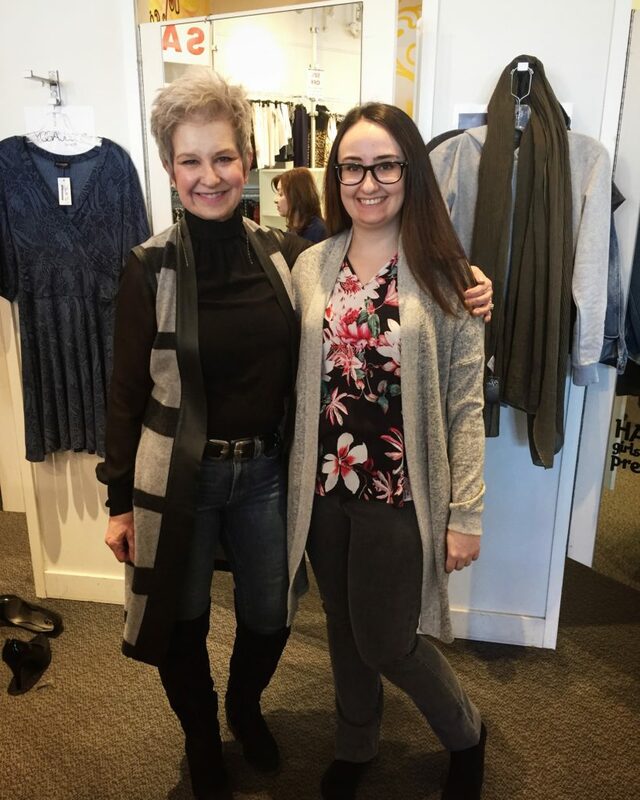 In the end, she walked away with some great outfits including this Soya Concept grey cardigan and floral blouse paired with some Canadian made and manufactured Yoga Jeans. You need to nourish yourself with self-love. We believe this makes you better able to love and serve your family and community and spread love and kindness to others. As human beings, we can be incredibly hard on ourselves. What makes your life and your outlook better is that feeling that comes from inside, not the size of your jeans or the price of your outfit. We know that being confident in your clothing helps you be the best version of yourself. At espy, it’s more than just getting styled. It’s about helping you cultivate a routine of self-love. If you want to learn more about Samantha’s story click here. #spreadloveyyc is happening until March 14th at espy. If you haven’t come and seen our love-lock sculpture you’re missing out. We’re raising money for Alzheimer Society Calgary and for a suggested minimum donation of $10, we’ll give you a love-lock you can attach to the heart-shaped structure we’ve placed out in front of the store. Heck, we’ll even engrave it for you. 100% of proceeds go directly to ASC and the goal is to raise $10,000. Get your love-lock today at espy.